Although the 3D printer seems to get the spotlight most of the time, people are making some very interesting projects where the laser cutter takes the lead role. Wherein I take a break from pushing pixels around to wire my biker scout trooper helmet for sound. Courtesy of Terrence Fagan, Engineering Chair at Central Piedmont Community College. Terrence has done a lot of great work in engineering education and outreach in his community. 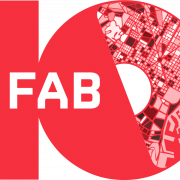 He had the opportunity to attend the Fab10 Symposium in Barcelona last July. When he started telling me about his experience there, I felt it was a must for a blog post.